There’s nothing we love more than beauty on a budget, especially when the product is actually worth way more than the price tag. “Cheap Trick” is our way of sharing our favorite wallet-friendly finds with the beauty world, so you can look great and have money to spend on more important things (like brunch with the girls). With nail art popularity continuing to soar, a woman’s manicure is sometimes her best accessory. However, most women do not have the time (or the budget) to go to their friendly manicurist every week to keep their nails looking their best. Luckily, Cutex has created a product that will help us fake those weekly visits all without the dreaded bill. 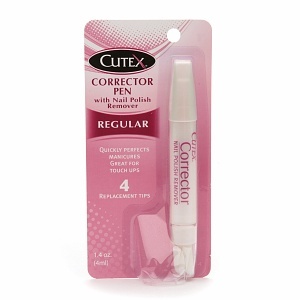 Introducing the Cutex Corrector Pen, a savior to the girl who has everything but a steady hand. The pen has nail polish remover included in the tip, perfect for fixing any mistakes made along the way. The narrow tip is also great for correcting hard to reach places without damaging the rest of the nail. With four replacement tips included and a price tag of under $4, your days at the nail salon may just be a thing of the past.